Dunland is a package of surprises. Half the module covers the region as advertised, while the other half features sites more interesting: a community of libertarian elves, a mutant dragon's lair, and Isildur's unmarked grave. It's a case of the extras overshadowing the main feature, which turns out to be not a bad thing at all when the latter has only so much to offer. I remember coughing up $12 with less than my usual enthusiasm for an ICE module, and when I read it that night was gobsmacked by Amon Lind. I don't mean to hold the poor Dunnish clans in contempt, and they're actually given provocative treatment. Their history starts in the Second Age when they lived in Gondor's White Mountains, well in tune with nature and the Valar until they failed in their oath to Elendil. All fifteen clans are described as they stand around the Great Plague period, each with unique character and cross-referenced as to how friendly they are with the others. Six call themselves the Daen Iontis (the "dispossessed" or "betrayed") to show their displeasure with the way their ancestors trusted the Dunedain; their goal is to retake the ancient homeland and drive the Gondorians back into the sea. Two take the name of their ancestors, the Daen Coentis (the "skilled people"), and look to that heritage as a goal to re-attain. The other seven remain more neutral, some on better terms with the former, others with the latter, but it's clearly the Daen Iontis who have the strength in numbers. 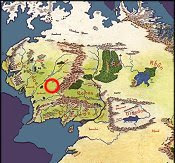 There is the grim Temple of Justice run by a messianic priest from Dol Guldur, though only the six Daen Iontis clans follow him. But the elves of Amon Lind steal the show. They are a complete invention on ICE's part, a small group of Noldor who left Eregion in the Second Age to continue their controversial projects without interference or censure. Their hanging fortress in the Misty Mountains is a wonder, with transparent floors overlooking air, and walls containing pipes that play songs inducing a variety of spell effects -- sleep, fear, holding, calm, or stun. Their creations are staggering, and remind of alien technology, especially Sulkano's air boats made with the rare metal Mithrarian which negates the effect of gravity. There are also Elenril's breeding experiments, resulting in what he calls the "weapons" of Amon Lind, human and elvish subjects merged with mammals like snow leopards and lynxes. While these elves aren't really evil, they are certainly laws unto themselves, and their obsessions off-kilter, and there is rarely any disciplinary action taken on grounds of individual freedom. The mapwork scores well. The town of Larach Duhnnan is as cosmopolitan as things get in Dunland, the center of trade and one of the few places where the clans intermingle. Miles away the Temple of Justice looms as the focal point of propaganda, holding the Daen Iontis clans in its power, and given four levels. 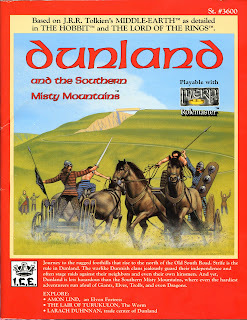 The two-page center map displays the Dunnish region and pinpoints the locations of all fifteen clans. The five-level fortress of Amon Lind, suspended on a western ridge of the Misty Mountains, rules the module, and is perhaps the closest thing in Middle-Earth to TSR's Expedition to the Barrier Peaks: one is hit by a true sense of the alien when walking into this fortress. Finally, the mutant dragon Turukulon's lair offers a nasty labyrinth of illusions, quicksand traps, and rich treasure in the spirit of classic D&D. And I like the special bonus of Isildur's grave, known only to the eagles and Gandalf, marked by a White Tree sapling. 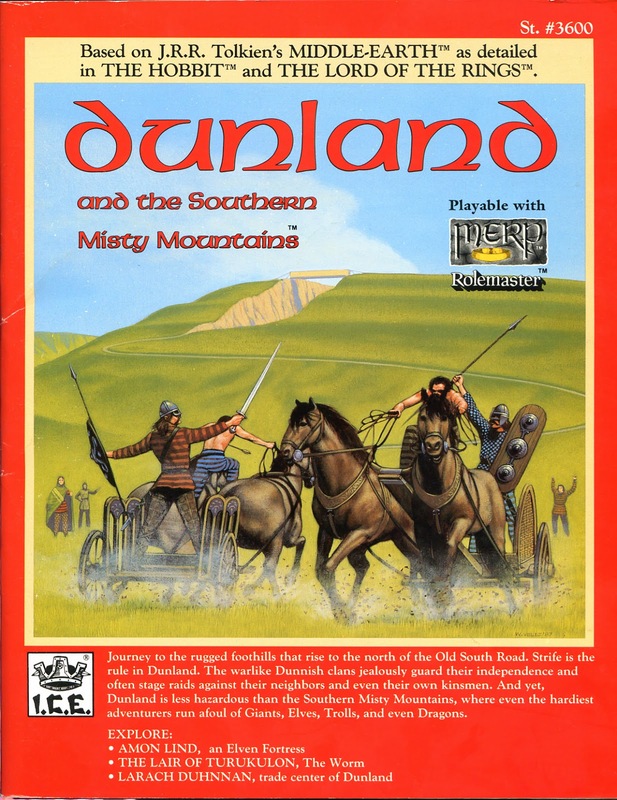 Dunland contains wonders I simply could never have expected out of a module devoted to a small region of primitives. Next up: Ents of Fangorn.